The Santa Semente Guesthouse is safe, clean, exciting, and affordable. We're located near the great nightlife of Lapa and the heights of the Christ the Redeemer statue. 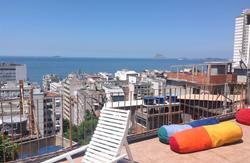 You'll find us in the beautiful, bohemian neighborhood of Santa Teresa in Rio de Janeiro. We specialize in foreigners who come to Rio on culural exchanges or to do volunteer work, but we host people who come to Rio just to have a good, relaxing time as well. Whether you want to party in Lapa, relax in Santa Teresa, or go to the beaches of Copacobana, our hostel is the one for you. Santa Semente is opening for carnaval 2014. Start early bookings today. 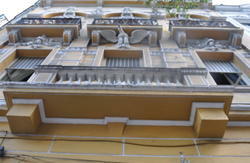 You can easily arrive at our house from Largo do Guimaraes, the center of Santa Teresa. 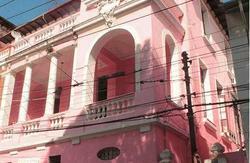 Once you come to Largo do Guimaraes, call us, or follow the street car track down the street Rua Pascoal Carlos Magno. You'll see many bars and restaurants, including Simplesmente and Bar do Mineiro. Keep following the track. Go left down Rua Monte Alegre. When you come to Rua do Oriente, go left. There will be a hill going up, and a hill going down. Go down the hill. This street is Rua Miguel Resende. At the bottom of a long slope, you'll come to a road going up to your left, and a road cutting back down to your right. In front of you will be a narrow street with a sign in front of it that says Santa Semente. Continue down this narrow, curving street. Santa Semente is the last house on the right. It has a yellow wall in front. Call us if at any time you are lost, and we'll come and get you! A note: Our address Rua Miguel Resende 328 is not on Google Maps. Go to Rua Miguel Resende 520 and then follow the sign that says Santa Semente.